STC would like to thank the following businesses that have provided funding (either directly or through their corporate foundation), in-kind donations, or resources to support the conservation and education efforts of the Sea Turtle Conservancy. Contributions such as these help STC continue to provide this website, and other free educational materials and resources, to those who are interested in sea turtles and their conservation. If you are interested in learning more about how you can contribute to STC’s efforts, please contact David Godfrey by e-mail or call him at (352) 373-6441. If you are interested in forming a Partnership with STC, please fill out a Partnership Proposal Form and email the completed form to Lexie Beach. Naked Turtle Rum: The Naked Turtle White Rum has partnered with the Florida-based Sea Turtle Conservancy (STC) to raise awareness and protect sea turtles. The Naked Turtle White Rum has supported STC’s darker shores project, as well as STC’s leatherback satellite tracking program. Currently, Naked Turtle Rum is running an “Every Bottle Saves a Turtle” program, which gives STC a donation of 50 cents for every bottle produced. Learn more about Naked Turtle White Rum. CERTINA: Swiss watchmaker, CERTINA, is the official timepiece of the Sea Turtle Conservancy. Certina’s connection with the turtle emblem goes back decades following the introduction, in 1959, of its acclaimed DS Concept protection system – the same year as the founding of the Sea Turtle Conservancy. Certina provides annual financial support to STC, sponsors turtles in the Tour de Turtles, provides high-quality and durable timepieces to STC staff and recently released a Special Edition Sea Turtle Conservancy Dive Watch. The company also is helping raise awareness about STC’s work around the world. Learn more about Certina. tarte: tarte’s founder set out to create a line of cosmetics that would prove glamour can be good for you by pioneering the use of high-performance naturals. Today, tarte is a leader in healthy, eco-chic beauty, offering cruelty-free cosmetics infused with skinvigorating ingredients like superfruit and plant extracts, vitamins, minerals, essential oils and other naturally-derived ingredients. But it’s not just about what’s in our powerful formulas; it’s what’s not in them that really sets us apart! All of our products are formulated without parabens, mineral oil, phthalates, sodium lauryl sulfate, triclosan, synthetic fragrances and gluten, just to name a few. Discover their cruelty-free and eco-friendly makeup at www.tartecosmetics.com. Pura Vida Bracelets: In the summer of 2010, while traveling through Costa Rica, Griffin and Paul crossed paths with two bracelet artisans named Jorge and Joaquin. Griffin and Paul partnered with Jorge and Joaquin in hopes of spreading the “pura vida” spirit with others. In the early days, they were only selling a few bracelets a week. Today, the bracelets are worn by millions of people around the world and their artisan community has expanded from Costa Rica to El Salvador, India, and more. Now 350+ artisans can depend on steady income in positive working environments, thanks to the support of Pura Vida Bracelets customers. The bracelets continue to serve as a tangible reminder to slow down and live in the moment. World Nomads:World Nomads a ssists independent and adventurous travelers to get the most from their travel experiences and explore their boundaries. Stay safe on the road with global travel insurance and the latest travel safety tips, plan your trip with insider destination guides and recommendations from other nomads, explore your passion for storytelling on a travel scholarship and give back to the places you love through our Footprints charity program. Four Seasons Resort, Nevis, West Indies: Supporting STC through sponsorship of the Tour de Turtles, providing special Adopt-A-Turtle packets to their guests. The Four Seasons is also working with STC to produce sea turtle educational materials for Nevis. The company’s guiding principle is the Golden Rule, and as such Four Seasons strives to have a long-lasting, positive influence on the communities where we operate and on the people we employ and serve around the world. Four Seasons involves employees and guests in the common goal of preserving and protecting the planet. We engage in sustainable practices that conserve natural resources and reduce environmental impact. Visit Four Seasons Resort, Nevis. Atlantis, Paradise Island, Bahamas: Supporting STC through sponsorship of the Tour de Turtles, Atlantis, Paradise Island is a unique, ocean-themed destination offers a variety of guest accommodations and 35 restaurants, bars and lounges to satisfy any palette. The focal point of the unique family entertainment experience at Atlantis is the 20 million gallons of fresh and salt-water pools and lagoons, amazing water adventures, cascading waterfalls, a marine habitat second only to Mother Nature with a remarkable, unparalleled assortment of exhibit lagoons and underwater formations – all located on a seemingly endless stretch of beach that has been called the most beautiful in the world. Visit Atlantis, Paradise Island, Bahamas. Disney’s Animal Program: Supporting STC through sponsorship of the Tour de Turtles, Disney’s Animal Programs is committed to delivering uncompromising excellence in animal care. Our Animal Programs team participates in cooperative breeding programs with other zoological facilities, works directly in field conservation, provides animal experiences at our theme parks, and offers tours and education programs. Through these activities, we create magical memories for our guests, while also making a difference for conservation around the world. Every year Disney supports cast members in developing and participating in local, national and international field conservation programs to study and protect wildlife. One ongoing project takes place on our own Florida beaches, where Disney’s Sea Turtle Conservation Program conducts daily sea turtle nest surveys and conservation research to ensure the long-time protection and survival of nesting sea turtles.. Visit Disney’s Animal Program. Disney Conservation Fund: Supporting STC through sponsorship of the Tour de Turtles. The Disney Conservation Fund enables nonprofit organizations to provide support for more than 45 species across the globe-from protecting the critically endangered Sumatran rhino in Indonesia, to tracking northern jaguars in the foothills of Mexico, to studying the threats of the endangered green sea turtle. Visit Disney Conservation Fund. Disney’s Vero Beach Resort: Supporting STC through sponsorship of the Tour de Turtles, Disney’s Vero Beach Resort is one part of the Disney Vacation Club. The Resort offers an alluring beach vacation on the Atlantic treasure coast for the perfect family holiday. Disney’s Vero Beach Resort offers incredible Disney service: sing-along campfires, tennis courts, backboards, wine tasting, craft making, and even pin trading. Disney’s Vero Beach Resort guests can experience lessons in surfing, snorkeling, fishing, jungle trial bike adventures, and sand casting. Your entire family will find something to get them into the spirit of the Sunshine State. Visit Disney’s Vero Beach Resort. Shark Reef Aquarium: Supporting STC through sponsoring the Tour de Turtles, Shark Reef is dedicated to establishing and maintaining the highest standards of animal care, to providing its visitors with an entertaining and educational experience, and to the practice of meaningful research and conservation initiatives. Several initiatives are taken by Shark Reef to encourage the message of conservation and preservation. Recycling facility water and implementing imitation coral into exhibits to preserve natural resources are just two of ways Shark Reef sets the example. Visit Shark Reef Aquarium. Ripley’s Aquariums: Supporting STC through sponsoring the Tour de Turtles, Ripley’s Entertainment, Inc. has entertained visitors around the world, with more than 90 attractions in 10 countries. Ripley’s Entertainment’s three aquariums in Myrtle Beach, SC, Gatlinburg, TN, and Toronto, Canada have educated millions of visitors. In the next decade, Ripley’s plans to open more aquariums in tourist markets throughout North America and the world.Visit Ripley’s Aquariums. RenaissanceRe: Supporting STC through sponsoring the Tour de Turtles, RenaissanceRe is a global provider of property catastrophe and specialty reinsurance, as well as insurance. Founded in Bermuda in 1993, we are now one of the world´s largest and most successful reinsurers of natural and man-made catastrophes. RenaissanceRe created the RenaissanceRe Risk Sciences Foundation to support advanced scientific research in natural catastrophes, the development of risk mitigation and adaptive techniques to safeguard communities, efforts that reduce the economic turmoil following disasters, and organizations that preserve coastal and other risk-exposed habitats. The Foundation promotes education, preparation, adaptation and mitigation of catastrophic risks through a number of activities. Visit RenaissanceRe. 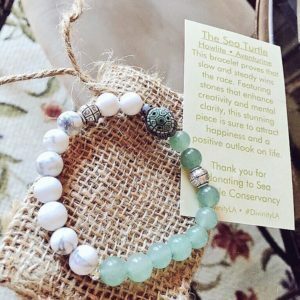 Billion Baby Turtles: Billion Baby Turtles is a program to raise funds for community-based sea turtle nesting beach conservation projects around the world. To date we have saved more than 100,000 hatchlings across Latin America! Billion Baby Turtles is an initiative of SEE Turtles & SEEtheWILD, projects of The Ocean Foundation. Learn more about Billion Baby Turtles. Turtle Lady: 10% of sales donated to STC.